In JungleDocs for Office 365, the GetView function is used to resolve items using the SharePoint View configuration and allows the use of View sorting, grouping and filtering (static filter). However, when more complex dynamic filtering is needed, the GetView() function with dynamic view feature can be used. 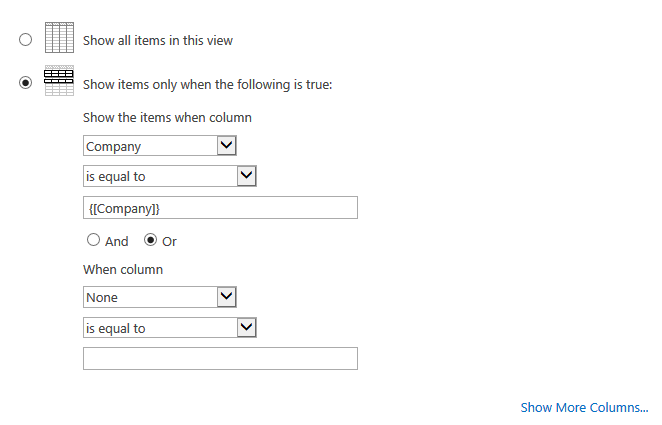 A dynamic view is created by using the GetView function that is inserted in a SharePoint view filter. Before using the view filters, JungleDocs for Office 365 processes functions and replaces them with real values which are recognized by SharePoint. Since SharePoint does not "understand" JungleDocs formulas, this view will normally return zero results in SharePoint. However, it will work in the app. Note: the context of a GetView() function will be used to process formulas in the dynamic view. This means that if GetView() is used in a document, the document context (metadata) can be used to process the formulas in view filters. 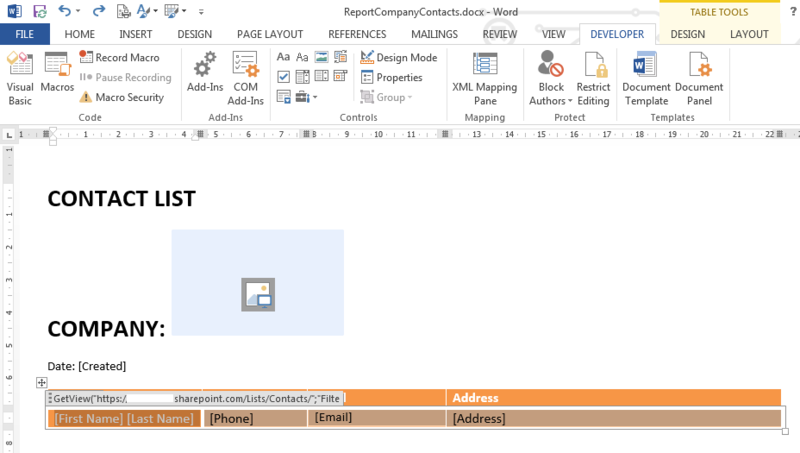 This provides the ability to use document columns in formulas. 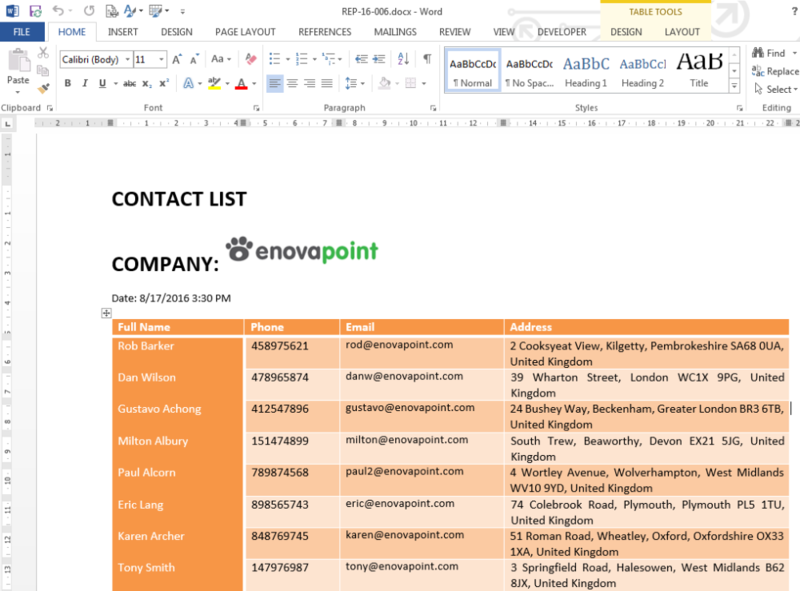 Let's say we have a Companies List, a Contacts List and a Word Reports Library for storing Word reports. Our goal is to to be able to select any company in the list and then get all the contacts for this company displayed in a report. The Contacts List has to have a Company Lookup Column referring to the Companies List. The Word Reports Library should also have a Company Lookup Column referring to the Companies List. Now, we need to create a view in the Contacts list (in this example we name it Filtered) and set a filter on a Company column. The value in the Company column should be equal to the Company column in the Word Reports library. Note: use a Rich Text content control for your GetView() configuration to be able to insert additional content controls inside. In the example image below, a Rich Text content control is inserted into the whole second table row with the GetView() function, and inside that content control there are additional content controls inserted in every column to take particular information from the Contacts list.